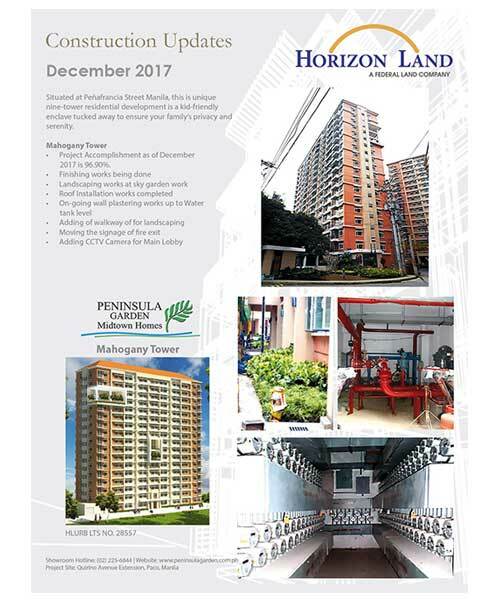 Peninsula Garden Midtown Homes is a kid-friendly residential condominium community designed to give a 100% safe and nurturing home for you and your children. Half of the property is dedicated to a huge garden for great outdoor adventures and relaxation. The community also offers multi-purpose halls, gym, swimming pool, daycare center, playground, meditation garden, clubhouse and more. Located strategically in the heart of Paco, Manila, Peninsula Garden Midtown Homes is accessible through President Quirino Avenue Extension and Peñafrancia Streets. Working parents can enjoy an easy commute to major business districts in Makati, Ortigas and the Manila Bay Area, while the children learn at nearby primary schools and universities and colleges at the “university belt” that include: Eton International School, Manila Science High School, University of the Philippines, De La Salle University, and University of Sto. Tomas among others. In the weekends, the family can visit the nearby parks and museums such as the Manila Ocean Park, Rizal Park and National Museum; and shopping malls like SM City Manila or Robinsons Place Manila. A township development in Marikina with generous open spaces, lush with greenery and natural lighting. Your luxurious home comes with the legendary Grand Hyatt Hotel service.